I used American Apparel Manila as a base, then I painted the Pure Ice French Kiss over it for the Swedish flags and logo. Topped it off with 2 coats of Seche Vite top coat. IKEA is great, isn't it? I'd say a Helmer holds upwards of 350 to 400 polishes, but it depends on the bottle size/shape. What color did you get? NICE! I worked at IKEA for a year in the Textiles department. It was quite the experience. :) Love the nails! LOL that's the funniest/coolest mani. I love it! 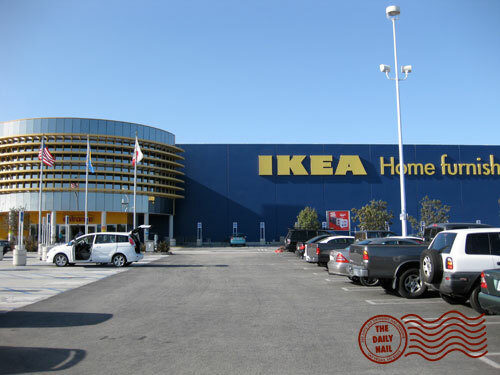 um is that totally the ikea in costa mesa?!?!?! I have a couple Helmer cabinets, but I have the smaller drawers meant for drafting - love them! 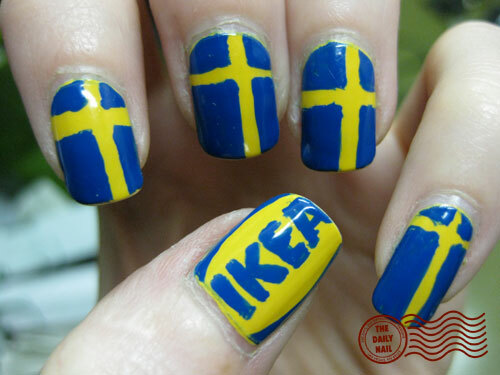 I have to ask, did you get a discount at Ikea for having your nails done in their honor? so fun !!! i have 2 helmer for my nail polish and 1 FOR MAKE UP !!! love them !! Yaaay, I never comment (shame on me!) but how can I not when you're sporting SWEDISH nails??! Awesome job a always, you rock! OMG! Krista doesn't know what IKEA is?!!!!!! Oh my goodness, I love Ikea!!! I live in Ohio so I actually have to drive to PA to get to an Ikea, there's one in Pittsburgh and one in Philly! It's always a long drive, but so worth it! I live a good 6 hours from Pitt and 5 hours from Philly i have never been to either city.... everyone is real surprised i don't know what it is... but no one told me either! LOVE the Helmer! I have one and I love it!!! I was skeptical about the drawers, but they fit polish perfectly, and hold up well. I wish they still made Helmer in green, because then I'd have several of them, but they don't, so I just have one. I have 85 (some minis) polishes in one drawer, and there's six drawers, so at least 510 assorted size polishes should fit. I don't have that many in each of the drawers, so I don't know if it would collapse or fall through the floorboards with that weight; but in theory, it could hold that many. Beautifully (barely) contained obsession. Yeah!